I welcome you and I rejoice to be able to do so while you are celebrating the fourth centenary of the return to the house of the Father of your foundress, Venerable Orsola Benincasa. I thank you for all the good you do in the Church and there where you work for the Kingdom of God: America, Africa and Europe. With you I also greet the Teatini Fathers who accompany you. You know that we Jesuits with the Teatines have a story a bit 'ugly ... We had a fight over time of Paul IV, a long time ago. Now we are friends. You are particularly attached to them since Mother Orsola, just before she died, entrusted her work and her Rules to the Teatini Regular Clerics, for the great esteem she had. Orsola Benincasa was a contemplative woman, I want to underline this: contemplation. Like the prophet Jeremiah, she too felt seduced by the Lord and allowed herself to be seduced (cf. Jer 20: 7). Throughout his life he sought full conformity to the crucified Christ, also thanks to mystical experiences. In love with the Eucharist, she made this Sacrament the center and nourishment of her life. Rooted in Christ and attracted by the light of the Immaculate Conception, he has left a charism that is inseparably Christocentric and Marian; and, as a testament, to live "without any other rule than love". And this is not easy! Starting from this centrality of Christ in his life, he was able to grasp the needs of the people, especially the young, living for the glory of God and the salvation of souls. On this spiritual structure, where Christ is the only highest good, daily life of prayer is supported. A prayer that, far from separating you from the world and its needs, leads you to love the world as the Lord loves it and wants it. In a particular way, it leads you to dedicate yourselves to the education and formation of the new generations, attentive to their human promotion and their growth in faith; this without neglecting your presence close to the suffering people, in whom you recognize Jesus crucified. In this way the Lord calls you to come out of yourself and to go to the existential peripheries, with freedom of heart. You find life by giving life, find hope by giving hope, find your reason for being in the Church and in the world, always loving and living according to the logic of the gift, the logic of the Gospel. I encourage you to be, on the example of your Foundress, teachers of experiential knowledge of God. Today's world needs witnesses of transcendence, of people who are the salt of the earth and the light of the world (cf. Mt 5,13-14) , let them be leaven in the dough (cf. Mt 13.33). Do not deprive the men and women of today of this food, necessary as much as the material bread. Together with people in conditions of material poverty, there are many who have lost the meaning of life, hearts parched and thirsty for good bread and living water, even without knowing they are waiting to meet Jesus. There are also hungry and thirsty hearts. Go to satiate that hunger, that thirst, where there is no ability to satiate with that illusion, the illusion of lights that do not give life, of the lights that do not illuminate. And to you as well as to the disciples, Jesus says today: give them something to drink and to eat (cf. Mk 6:37), that bread which satisfies, that water which satisfies. If you are open to the action of the Spirit, He will guide you to respond creatively to the cry of the poor and hungry and thirsty of God. The Spirit himself will help you to ask: what does the Lord and the brothers ask of us? It will help you to stay awake, vigilant as sentinels of the Lord, so that the light and the warmth of God's love can reach the people you meet and awaken hope in them. The world also needs your testimony of fraternal life in the community. Fraternal life is not easy, it is not easy. There is always something to fight, to talk badly. It's true? Always always. It's ugly to talk bad about the family. It's ugly, but there's a remedy, a very good medicine for not talking bad: bite your tongue. It swells, but does not spill it. Try! Therefore, the spirituality of communion, the spirituality of living together, so that the community journey becomes a "holy pilgrimage" (cf. Apostolic Exhortation Evangelii Gaudium, 87). Removing criticism, gossip, rivalries, and practicing instead the reception and mutual attention, the sharing of material goods, respect for the most fragile people (cf. Letter to all consecrated persons, 21 November 2014, II, 3 ). This is very important: taking care of the elderly. They are the memory of the congregation. Do not leave them there in the infirmary, abandoned, no. Go to them, let them talk - they are memory -, caress them. Do not forget about the elderly. Always resound in your hearts the will of the Foundress: "Love one another. Respect each other. Each one seeks the good of the other ". This is a beautiful road to holiness! 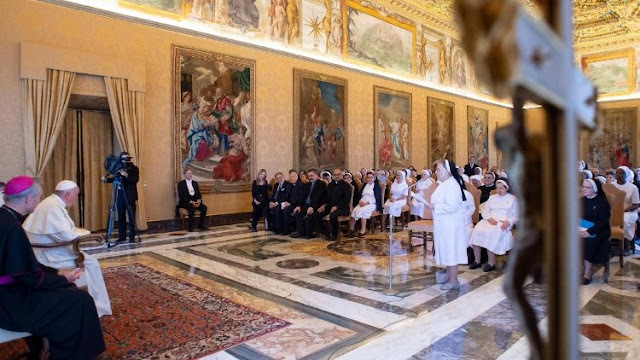 In this way, you will incarnate the commandment of love where you live and work: in schools, in parishes, in nursing homes, in every place where the Gospel of Christ is brought with life and words. In this way you will always be constructors of communion within your Institute and beyond it (cf. John Paul II, Apostolic Apostolic Exhortation, Post Consecrated Life, 51). Mary Immaculate, whom you venerate as a model and patroness, obtain for you the grace of being passionate women of Christ and of humanity; to continually set you on a journey to serve the most needy, as she did in the Visitation (cf. Lk 1:39); to know how to be there where your presence is necessary as disciples of the Lord and consecrated women (cf. Acts 1: 14). For all this, I cordially impart my blessing. And you, please, do not forget to pray for me. Thank you.